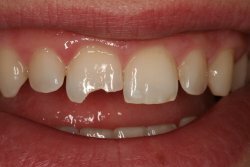 One of the most frequently performed cosmetic dental procedures to correct spaces, minor chips, and abrasions is cosmetic bonding. During the procedure, our dentists take tooth colored restorative materials and bond them directly to your affected tooth to correct any imperfections that exist. 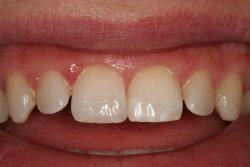 Because cosmetic bonding is a relatively non-invasive procedure, patients who are generally satisfied with the overall look of their smiles often find it a great option to correct small issues. These photos were taken of actual patients of Dr. Karen Rethermeyer.